Oven-baked recipes are a life-saver for those of you who are busy. 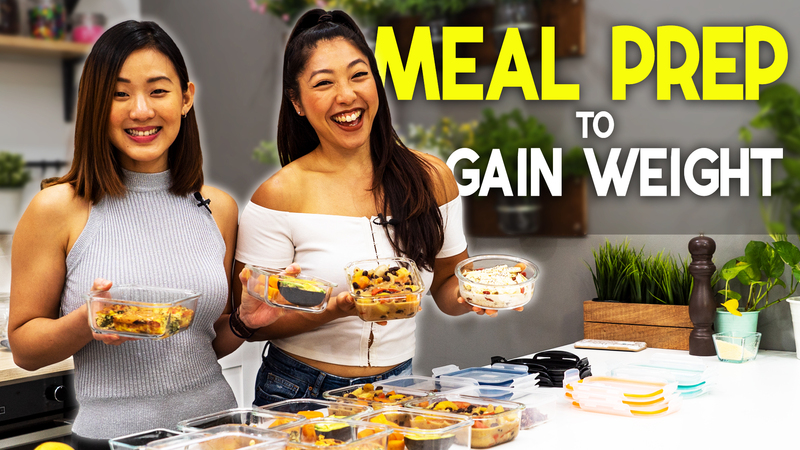 All you need is to do a little bit of prep work, pop it all in the oven, and you can get on with doing what you need to, while a nutritious meal is cooking for your family. It’s a healthy and wholesome meal all in one tray. The formula is really simple. Combine Protein + Vegetables + Oil + Seasoning and you have your dinner! 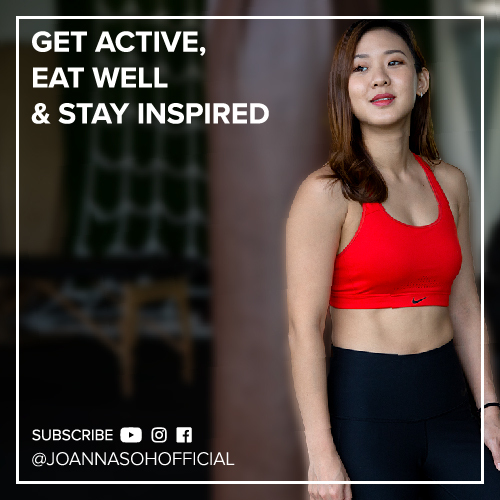 I love oven-baked recipes because that means I can get on to do other things, for instance, I can fit in a workout session while waiting for dinner to cook. Here are 3 recipes which will save you time and make your life that little bit more efficient. Start by Pre-heating the oven to 220°C/425°F. Then slice up all the vegetables, about 2 carrots, 1 head of a Broccoli, 1 sweet potato and 1 red onion. And crush about 6 garlic cloves. Rub the chicken legs with olive oil and season with salt and pepper and fresh rosemary, Set aside. 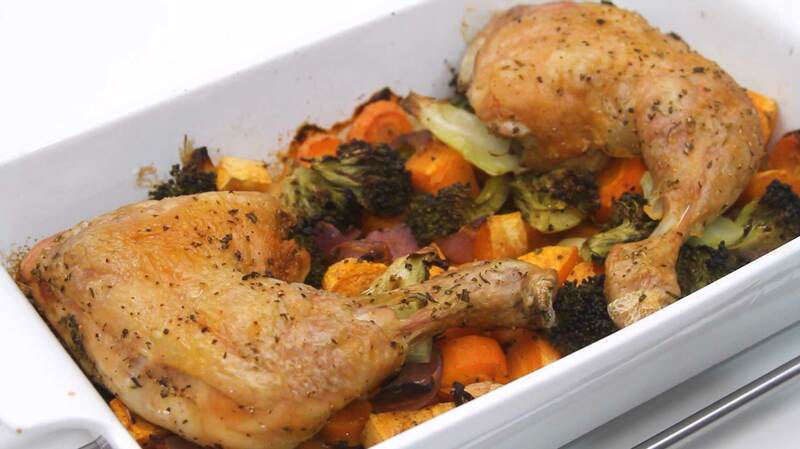 Next, make a bed for the chicken by arranging all the chopped up vegetables on the bottom of a baking dish. Season the vegetables with ½ tbsp. of olive oil, 1 tbsp. apple cider vinegar, salt, pepper, ¼ tsp. mixed herbs and some rosemary. Give it a good mix. Then, arrange the marinated chicken on top of the vegetables. Bake in the oven for an hour or until chicken is done. Serve warm! Cooking with herbs and spices is a great way to pack more flavours into a dish WITHOUT the added calories! Each serving has about 540Cals and it’s a very filling meal. You’re getting your protein from the chicken leg, good crabs from the sweet potatoes and at least 3 servings of vegetables. This makes a great post workout meal! Let’s prep the salmon. Marinade the salmon fillet with about 1 tsp. of olive oil, salt & pepper, ¼ tsp of chopped rosemary and 1 minced garlic clove. Gently massage the seasoning into the salmon and set aside. Now, let’s prep the vegetables. I’ve sliced up about half a zucchini, half a cup of cherry tomatoes and half a lemon. Line a baking tray with tin foil. Then make a bed for the salmon fillet by arranging all the vegetables on the bottom of a baking dish and season with salt and pepper. Place the salmon and drizzle with about 2 tsps. of freshly squeezed lemon juice. Seal it all in tightly. Place into oven and bake until cooked through for about 30 minutes. Serve hot and enjoy. Each serving has about 470Cals. This dish is packed with Omega 3 fatty acids from the salmon and you’re getting at least 2 servings of vegetables. What I like about this dish is that you can prep ahead and store them in the freezer. 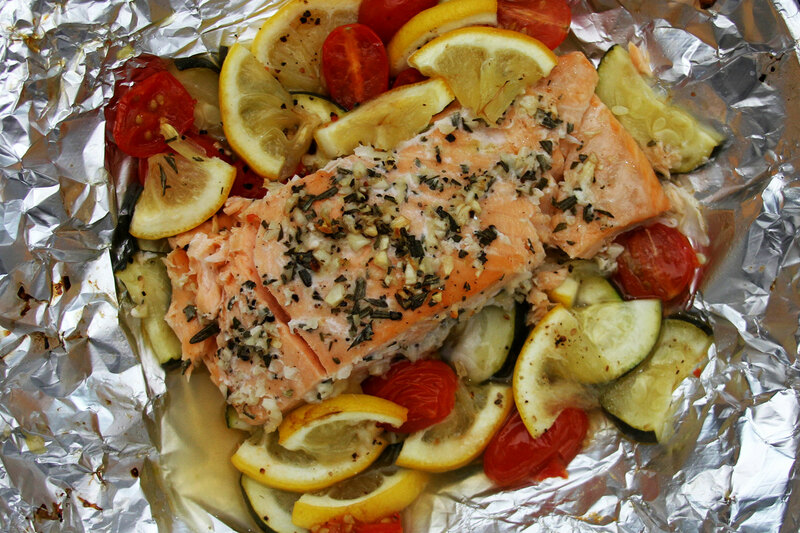 When you want to have it for dinner, simply place the entire salmon foil to bake in the oven. And the final recipe is a vegetarian option, my healthier version of Aubergine & Black Bean Ratatouille. Pre-heat the oven to 220°C. Slice up 2 aubergines and 1 whole zucchini. In a large bowl, season them with 1 tablespoon of olive oil, and salt and pepper. Toss well. In another bowl, mix in diced tomato, black bean, onion, garlic, cayenne pepper and salt & pepper. Set aside. 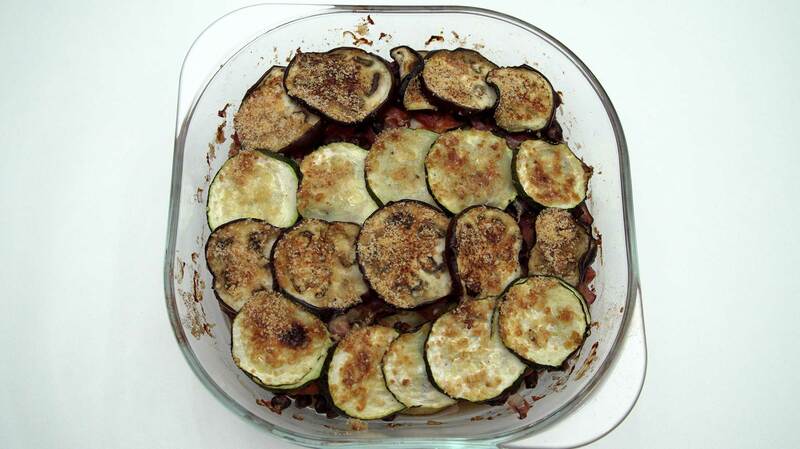 In a baking dish, arrange the aubergine and zucchini slices in a single layer. Pour in a layer of the black bean sauce. Then top it up with another layer of aubergine and zucchini slices. Repeat until the baking tray is filled. Finally, sprinkle with some grated cheese. Bake in the oven for 30 - 40 minutes. until the top layer is golden brown. Serve hot. Each serving has about 241Cals. If you’re a vegan, you can simply omit the cheese. This is a great main dish or it can even be served as a starter. You can even prep and cook all these dishes in bulk. They will keep well in the fridge for up to 3 days. Simply warm them up and you have a healthy and wholesome meal. Again will all my recipes, they are very easily adaptable. You can change the vegetables or protein to suit your taste.